Colour is an interesting subject, guaranteed to get everyone talking and doing, and is ideal for engaging people from all walks of life. Community collaboration initiatives have included talks, training, taster sessions and workshops to improve occupation and well-being for the following individuals and groups in Northmptonshire, UK. Age UK Northamptonshire: community groups countywide. Homestart: supporting families with children under 5. Older adults with physical and mental health problems: NCC. Older adults with physical and mental health problems: 10 week course, NCC. Sessions are designed specifically to enhance occupation and well-being and tailored to individual requirements. Photos from the Colour my Well-being International Conference, 2012, hosted by the University of Northampton and in association with the Journal of Applied Arts & Health. 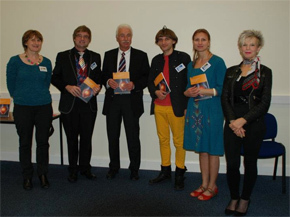 Left to right, some of the committee members and keynote speakers; Sue Griffiths, Dr Ross Prior, Dr Andreas Edelmann, Neil Harbisson, Vanessa Volpe and Jane Mills. Colour for Well-being workshop, facilitated by Vanessa Volpe. 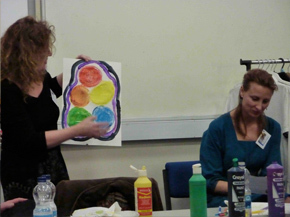 Sarah Gillard (left), contemporary artist and arts workshop facilitator, exploring and explaining her perception of colour well-being to other delegates during the workshop. The publication below introduces theoretical background, session outlines and Learner outcomes following colour for well-being intervention. In collaboration with the University of Northampton since 2007, developing and supervising role emerging occupational therapy undergraduates in non-profit, charity and primary care. For an informal discussion about using colour for well-being in your work place, collaborative working, evidence based practice and engaging communities please get in touch. Member: British Association of Occupational Therapists, maintaining ethics, professional conduct and quality standards for registered occupational therapists. Member: Health and Care Professions Council, regulatory body for allied health professionals in the UK. all week, able to manage, the stress has gone. Role emerging occupational therapy 2012: Supervision. While on practice placement I was fortunate to have Vanessa for my professional supervision. My supervision was a time I looked forward to and became an invaluable part of my learning experience. Through nurturing my strengths and challenging my decisions Vanessa provided me with the opportunity me to strive and grow. Her encouraging approach allowed me to develop my professional and therapeutic skills. Vanessa’s ability to actively listen combined with her empathy and understanding encouraged me to develop my potential further than I had imagined. Through this supervision I felt myself grow both professionally and personally, and I gained the opportunity to develop into a more confident practitioner. Supervision with Vanessa Volpe provided an empowering experience, and I continue to develop using the practical advice and professional standards that I learnt through that experience.